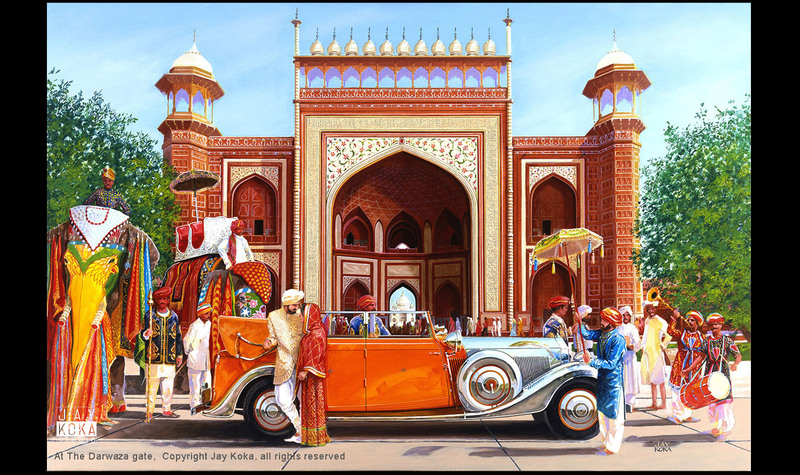 Title: "At The Darwaza Gate"
The 2012 Pebble Beach Concours d’Elegance featured a special exhibit of “Maharaja” cars from India. I saw the Star of India there and thought that such a beautiful car should warrant a painting of some sort but I wasn’t sure at the time what it could be. Fast forward to 2017 and Cathy and I are on another of our Asian voyages and find ourselves in Agra, India on the grounds of an area commonly referred to as the Taj Mahal. To say it is beautiful is an understatement of epic proportions. It is the equal of “The Great Pyramid” and “Machu Picchu” in every sense of the word, both of which I have been privileged to experience in person. The “Taj” is perhaps the most beautiful building I have ever seen. An odd thought when one considers that it is a mausoleum. I am always on the hunt for settings for future paintings. As I absorbed the “Taj” grounds, I knew there was a painting here, just not how it would work out. I thought the last thing the world needs is another rendition of the Taj Mahal and I also thought that a car adjacent to the “Taj” itself would be at best strange… and at worst, culturally insensitive. You can’t see the “Taj” even once inside the main entry gates of the 42 acre grounds. You approach along a lengthy corridor of red sandstone buildings culminating in a ninety degree right turn to face the wonderful Darwaza Gate. As you approach the building, you see the spot at which the “Taj” will appear. You then walk through that portal from darkness to brilliant sunlight and there’s the “Taj”…but it takes a moment to resolve itself. Every step is a brilliantly designed and executed drama.I was reviewing my onsite photos of the Taj Mahal in late 2017 and tried a number of drawings with the “Star” and the “Taj” itself. They all seemed contrived and ordinary. And then I stumbled on the idea of the Darwaza Gate…. and the rest of the story is in the painting. This is the most complicated and most researched painting I have ever completed. I don’t think anything in the painting has every actually met anything else. Of course, the scene depicted in the painting is entirely invented. I wanted to capture not just the famous car and iconic buildings but also to present a look at the rich culture of India. The Star of India is now back in India in the hands of Maharaja Mandhatasinh Jadeja, grandson of the Maharaja of Rajkot, the original commissioner of the magnificent 1934 Rolls Royce Phantom II. The car represents a vital element in the automotive history of India with iconic names such as the Father of the Nation Mahatma Gandhi and Queen Elizabeth of England being some of the most celebrated individuals having taken a ride in this special car. Finally, it took 22,000 craftsmen 22 years to create this architectural masterpiece. It only feels like it took 22 years to complete the painting.